Rhonda Holberton, "Still Life (Vanitas)," 2017, archival pigment print, 19 x 23"
The fluidity between the digital and the analog is what the three person exhibition “Between Here and the Machine” is all about. In two- and three-dimensional works, Bean Gilsdorf, Anthony Discenza and Rhonda Holberton probe the uneasy relationship between the digital and physical worlds. Gilsdorf reimagines images from mass-media history books as soft sculptures. There is an uncanny, neither-here-nor-thereness to sculptures such as “Thin King” and “MT.” With their tabloid-photograph faces and ill-fitting clothes, their tripods and display stands functioning as ersatz legs, the works are grotesque amalgams of real people and plush toys — humanoid but not human: cyborgs. The idea of dehumanization is echoed in Discenza’s composites of image-search returns. Each of the 149 individual thumbnails in his 2018 iPad display, “Image Search Composition 106702 (Processing Set)” has visual interest on its own terms. But the numbing repetition of the same and similar images erases the individuality of each photograph and homogenizes what is otherwise sui-generis. This is what happens when an image metastasizes into glut. 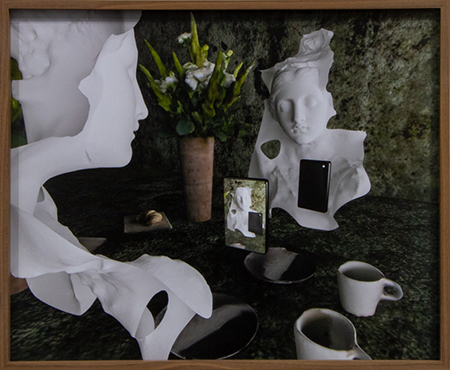 Holberton’s “Still Life (Vanitas),“ overlays computer-modified figures, rendered as hollow statues, onto a breakfast-table scene. The two figures, each staring at an iPhone, sit with cups of coffee, wholly disengaged from one another — empty shells absorbed in their screens. Chillingly, all three artists demonstrate the whiplash that all of us as media consumers increasingly feel between “real life” and the mediated simulacrum of real life we experience through the 0’s and 1’s that underlie the digital realm.